I bought these sweet little cross-body bags for my “big” kids. It took three tries on Amazon. I love this little bag for a couple of reasons, mainly because it’s small. By the time kids are 5 or 6 years old, they don’t really need a ton of stuff to entertain them on the plane. My girls, Calais especially, is a bit of a hoarder and will fill every last inch of available space. The compact size of this bag helps prevent that! It’s also nice to have a separate bag to use on the plane. We can put the “big” pack in the overhead bin, or shoved way under the seat, and this one is easily accessible. We have our kid-distractors down to a couple of well-loved items. Pencil Crayon and colouring book. I love these double sided pencil crayons. The little metal tin is perfect for traveling, and because they’re double sided there’s more colours per coloured pencil! You can buy them on Amazon, or find them at World Market! Boogie Board Jot 4.5 – we absolutely LOVE these…and often carry an extra when we travel since they’re small and seem to easily misplace themselves. These are great for drawing, hangman, X’s and O’s, etc, and provide great entertainment while waiting for dinner at a restaurant. Just be cautious. Many of the new ones don’t come with a cover, and the screen gets wrecked quickly if it’s not protected. Ety-Kids Earbuds – These are amazing! They are easy to pack. They are incredibly comfortable, and they have great sound control so little eardrums don’t get damaged. I also love the little carry-case so they won’t get lost! Lego-kit. This is a home-made version with a cut-to-fit Lego baseplate stuck to the top of a tupperware container with a cell-phone sticky pad. This provides us hours of entertainment on any form of transportation. Play pack. You can find them at Target, Michaels, Dollar store, etc. They have a little colouring book, some stickers and 4 crayons. They don’t last long, but the stickers are always a hit! Notebook. We have one with lined pages and one with blank pages. The girls like to “journal” in the lined book and draw pictures on the blank pages. You might also want to pack a few of these kid’s travel journal pages for them to document their trip! We’ll each pack a phone and iPad Mini, so there’s always a device loaded up with games and movies. We pack those in our own packs so the girls don’t think they’re a free-for-all at any time. Read More: Check out these great unplugged travel ideas too! This, plus in-flight movies, will keep them entertained for an almost unlimited amount of time! When we arrive at our destination one or two things can come out, the water bottle can clip on, and they’ve got a day-bag ready to go. I’ve been warned it will accumulate rocks along the way. It wouldn’t surprise me if we end up with a world-wide rock collection from Calais! Here’s everything each girl carries, their pack on their back and the little cross-body bag on the front. Am I missing anything? Is there something you’d add to the plane-bag? 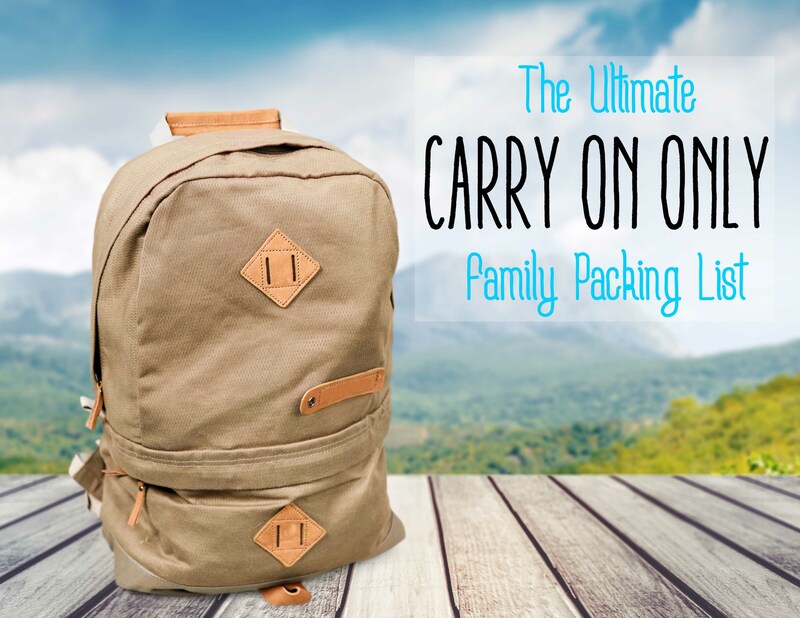 Wondering what to pack in the “Big pack”? Find it here! I was thinking about adding some healthy snacks, but quickly figured that it’s a bad idea, haha. Everything would get messy real fast. Thanks Oscar! Snacks are a great idea, but you have to be picky and definitely choose non-messy snacks! My girls love being able to buy a snack on the plane. It gives them something to look forward to, and then distracts them for a bit!